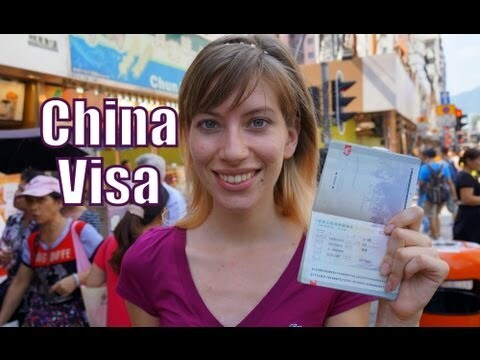 Did we (or did we not) get our Chinese tourist Visa issued in Hong Kong??? Very exciting afternoon over here. We’re leaving our apartment in Mong Kok and we’re going to walk over to the Chinese Embassy to see if our Visas for China have been approved or not. So keeping our fingers crossed. The reason we’re a little bit concerned is that the Visa process has changed for getting a Visa. Now for China you need more documents. You need to be able to prove you can get out of China. You also need to be able to prove accommodation for your first night there. So our problem is that our train tickets don’t actually match our final destination because we weren’t able to purchase train tickets to Guilin from Hong Kong. We actually need to be in China in order to do so. So we’re going to see how that works out. Hopefully they are not too picky about the application. So the agent who is taking care of our Visa process for us didn’t sound very confident, so I’d say there is a 50-50 chance we’re going to get our Visas or not. So we’re going to find out soon. Well, I’m convinced we’re going to get the Visa because I’m a little bit more optimistic than Sam over here. So what is your probability? 98%. So these are the people that are going to decide our travel fate. Let’s go find out. Ooooh. Bad news. We got em!!! We’re getting Taiwanese milk tea with tapioca pearls. I’ve become addicted to it since I got to Macau and Hong Kong. Is this your way of celebrating? We’re going to China. We’re going to China.